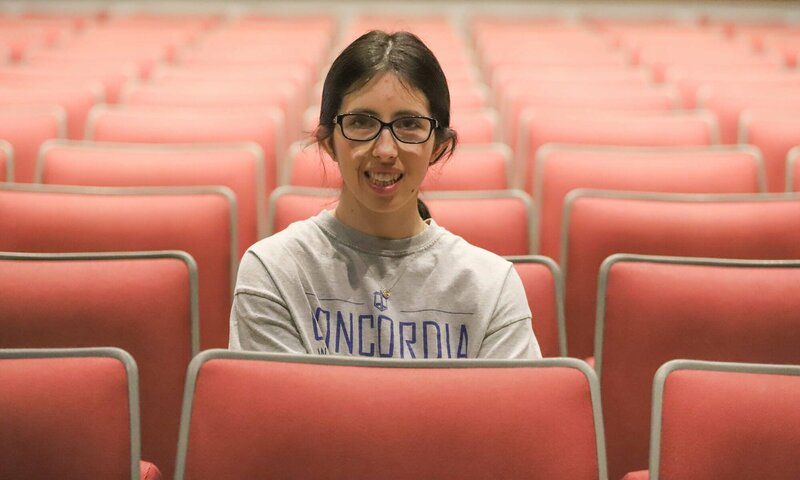 Sabrina Staskal poses in the Todd Wehr Auditorium on Concordia University Wisconsin's campus. Staskal has aspirations of becoming a professional actress and is currently enrolled in a theatre course through Bethesda College. Editor's note: This story, written by Colleen Jurkiewicz, originally ran in the Tuesday, March 26, edition of News Graphic, the community newspaper of Ozaukee County. Today, more than four million Americans have an intellectual or developmental disability. During March, Bethesda Lutheran Communities celebrates National Developmental Disabilities Awareness Month to heighten awareness of the needs faced by these individuals and to increase opportunities to create meaningful communities where they can thrive. Currently, only 16 percent of people with intellectual or developmental disabilities have paid, integrated employment. It’s a normal Thursday in Lori Woodall’s musical theatre and dance class, held in the Todd Wehr Auditorium on the Concordia University Wisconsin campus in Mequon. A group of about a dozen young coeds in sneakers and workout gear warm up to pop music before getting down to business rehearsing a musical number from “West Side Story” for their upcoming spring showcase. Sabrina Staskal has gamely agreed, with a couple of her female classmates, to fill out the male chorus in “America” to make up for the class’ lack of gentlemen performers. She sings and chasses with the rest of the “Sharks” as Woodall takes them through the choreography, beat by beat. “Anna” would be Anna Thomack, a junior who is never more than a few yards away from Staskal. She blends right in, doing the choreography along with her, partnering with another female performer when needed. She appears to be just another student, but she’s actually filling a key role in this classroom and in a larger on-campus effort to be inclusive of differently abled students. 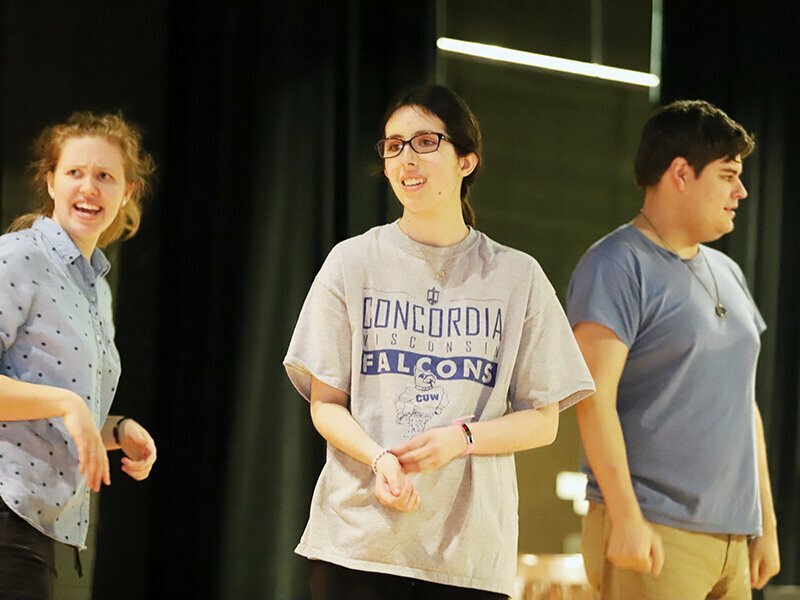 Sabrina Staskal (center) rehearses a musical number from "West Side Story" during a theatre class at Concordia University Wisconsin March 14. Staskal, 18, is a student in the Bethesda College of Applied Learning, an innovative collaboration between CUW and Bethesda Lutheran Communities. Thomack is Staskal’s “student-instructor,” who accompanies her to select classes. “The first time I met her, I thought she was going to be the best student-instructor—and she is,” said Staskal. Bethesda Lutheran Communities is a Christian nonprofit that operates a wide variety of support programs for those with intellectual and developmental disabilities throughout the country. Now in its fifth year, the Bethesda College of Applied Learning is a two-year certificate program that gives students with intellectual or developmental disabilities the opportunity to have an immersive college experience, gain real-world skills and prepare for a career after graduation. The Bethesda students audit Concordia classes, complete volunteer hours and participate in off-campus internships. For Staskal, it’s about more than just college—it’s community, too. She moved with her family from California last summer for her father’s job. Her mother heard about Bethesda and encouraged her to enroll, eager for her to have a post-secondary education experience. “I had no friends here, because I was new, but now that I’m here I’m making all these friends in my classes,” said Staskal. There are currently 12 students enrolled in Bethesda. Staskal, like Thomack, lives on-campus, and though she is technically an auditor of her CUW classes, for all intents and purposes she is very much a CUW student. Last semester, she even performed in the Concordia University Players’ performance of “Guys and Dolls”—an experience throughout which Thomack was by her side. Staskal and her fellow Bethesda students also participate in on-and-off-campus internships (she works at the Mequon Nature Preserve, ferries a snack cart through the administrative offices at CUW and works at the pharmacy) and are required to perform 48 hours of community service for their Independent Living class. The students have worked with charities that include Mr. Bob’s Under the Bridge, Capuchin Community Services, The Guest House, Wisconsin Humane Society and Hunger Task Force. On-campus, they’ve cooked for the homeless, made prayer books and participated in clean-up efforts; they’ve shared Christmas cards at Newcastle Place and assisted at Gems of Hope events at glaze pottery in Thiensville. It’ the role of the student-instructor that helps make the program effective, providing a bridge of support and communication between the Bethesda students and the CUW campus. There are currently 10 students who work as student-instructors for various classes. Thomack, originally from Illinois, joined the Bethesda student staff three years ago, when she heard they were looking for someone to accompany Bethesda students in theatre courses. She’s an education major, but has a passion for performing that dates back to her high school days. For more information on Bethesda College, click here.